On February 1, 2016, after many delays over whether the MQ-25 (formerly known as RAQ-25, Unmanned Carrier Launched Surveillance, and Strike - UCLASS) would specialize in strike or ISR (intelligence, surveillance, and reconnaissance) roles, the U.S. Department of Defense (DoD) has chosen — neither. However, for the fiscal year 2019, the budget request included a dedicated US$ 719 million fund for MQ-25A Stingray system development. It was reported that a significant portion of the UCLASS effort getting directed to produce a Super Hornet–sized unmanned carrier-based aerial tanker as the Carrier-based Aerial-Refueling System (CBARS), with "a small ISR package" integrated to relay communications to boost battlefield situational awareness, with strike capabilities deferred to a future version of the proposed aircraft. The new concept was named Unmanned Carrier Aviation Air System (UCAAS) with two key performance parameters - Mission Tanking and Carrier Suitability i.e., carrying 15,000 pounds of fuel at 500 nautical miles (NM), enabling two F-35’s to operate around 1000 NM from the carrier strike group, plus, a 12 hours flight endurance without being refueled. Experts are calling this development a negative one because it undermines (as well as downgrades) the "third offset strategy", which advocates for the development of next-generation power projection platforms. However, from the other end, the Pentagon apparently went ahead with this "new program" to address the Navy's expected fighter shortfall by directing funds to buy additional F/A-18E/F Super Hornets and F-35Cs. On July 20, 2017, a draft RFP for a planned engineering and manufacturing development (EMD) contract (to be awarded in 2018) was issued directly to the four organizations – Boeing, Lockheed Martin, Boeing, General Atomics and Northrop Grumman. But, in October 2017, Northrop Grumman, dropped out of the competition. Now, only three contractors are in the race and competing under new acquisition rules that allow the service to provide less specific guidelines for the Stingray as a rapid prototyping effort. January 3, 2018, was the deadline to receive the proposals from the competing contractors. The selection of the winning bid is scheduled for August 2018. In December 2017, a couple of weeks before the deadline, Boeing's Phantom Works team unveiled its MQ-25A Stingray concept based on its lessons learned from its Phantom Ray unmanned demonstrator and other Boeing unmanned aerial systems. And later, on April 13th, it released full-fledged teaser video on its official YouTube channel. The concept is powered by Rolls Royce AE3007N engine — the same proven powerplant that is used on the RQ-4 Global Hawk and MQ-4C Triton. In March 2018, Lockheed Martin's Skunk Works unveiled its MQ-25A Stingray concept, a "purpose-built" unmanned aerial tanker for U.S. Navy in a series of images provided to local/national media house and later, on April 9th, it released full-fledged teaser video on its official YouTube channel. According to company's statement, the concept is designed "to deliver robust refueling capability to support combat strike fighters and extend the range of American aircraft carriers." By looking at the images and the video, it appears to be a single D-704 buddy tank just to the left of the centerline of the airframe and a collection of sensors in the nose of the aircraft. On April 9, 2018, Lockheed announced the General Electric F404 turbofan as its propulsion system for its MQ-25A concept. In November 2017, General Atomics - Aeronautical Systems Inc. (GA-ASI), released the first deck handling system demonstration reel of its concept. 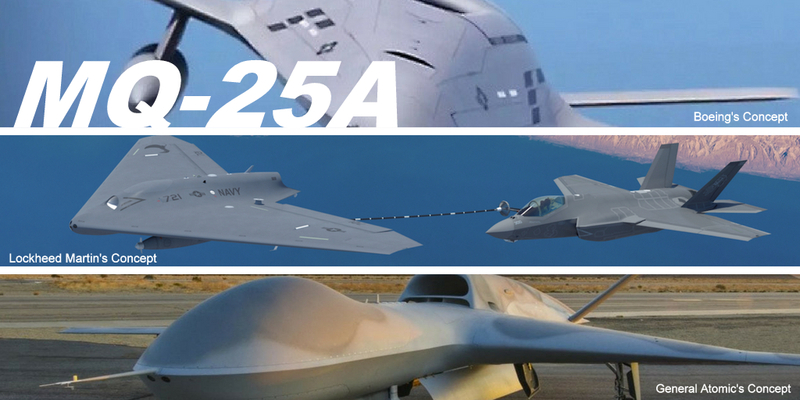 In February 2018, GA-ASI announced it had inked a deal with Boeing to work together developing GA’s MQ-25A design if the latter one wins the bid. According to Chuck Wright, the MQ-25A program director for General Atomic - "If you think of it from the big Boeing perspective, they’ve got their prime offering, and they might win, but when General Atomics wins, Boeing will win too," He further added, "They’re covering their bases." Later on, in April 2018, GA-ASI revealed Pratt & Whitney PW815 engine to be the propulsion system for its concept. On April 5, 2018, Pratt and Whitney team subsequently completed the first powered test run of the PW815 engine with the GA-ASI MQ-25A inlet and exhaust configuration.